Perhaps no other sandwich has benefitted more from the broadening of the American palate than the cheesesteak. In recent years, nearly every national publication, including print news, magazine journalism and television, has devoted ink and airtime to spotlight the classic American sandwich. The Internet is especially important, as it has granted the millions of Americans who are cheesesteak enthusiasts a forum to discuss, argue and admire everything about why the cheesesteak sandwich, invented during the Great Depression as an alternative to hot dogs, is so great: the simplicity of the ingredients, the authenticity, the history. They also can debate where to find the best cheesesteak franchise anywhere in the world. As the media has taken note, so have national brands. A version of a cheesesteak is featured on the menus of SUBWAY®, Jersey Mike’s®, Wawa® and Firehouse Subs®. Even farther afield, Papa John’s® offers a cheesesteak pizza, and Herr’s® sells cheesesteak-flavored potato chips. While the exposure is helping to get the word out about cheesesteaks, for the millions of loyalists, the biggest sticking point is authenticity. Thrillist® published an article called “10 Ways to Spot a Fake Philly Cheesesteak,” which finds Tony Luke’s® of Philadelphia declaring that a cheesesteak isn’t authentic if “it doesn’t have American cheese or provolone,” and that the bread “should be slightly crusty on the outside and soft on the inside.”¹ So amid the debate, the media coverage and the growing demand for great, traditional cheesesteaks, is there a national brand that is getting the cheesesteak right? Enter the Great Steak™ franchise opportunity. With more than 100 locations across the nation, America’s Premier Cheesesteak® franchise was founded by two brothers who fell in love with cheesesteak on a trip to Philadelphia in 1982. 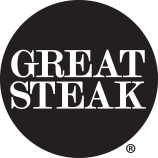 Great Steak was one of the first brands to bring the classic cheesesteak experience to the rest of America. Led by a passionate executive team with proven experience in growing franchise systems, Great Steak is poised to become the premier cheesesteak franchise nationwide as it captures a significant share of the nearly $22 billion-plus sandwich industry, according to IBISWorld®². With a low initial investment, Great Steak is a chance for new and experienced entrepreneurs to become a community’s go-to local restaurant for the classic American cheesesteak experience. You can own and manage a business that focuses on the cheesesteak in its classic form, as well as in new and innovative styles. Food Court Model: This is the perfect option for a savvy entrepreneur who wants to run a simple business with a small staff, low overhead and few moving parts. Our food court counters are custom-designed to showcase the theatricality of cooking a cheesesteak: when customers walk up to a Great Steak in a food court, they get a perfect view of their cheesesteak being cooked. Our strong history in malls across America for more than 30 years demonstrates that this model can generate a rapid return on investment. In our three decades in business, Great Steak has developed relationships with several of the largest mall companies in America, and they cannot wait for Great Steak to enter their marketplaces. In-Line Restaurant: This model is for savvy entrepreneurs who want to bring the classic American cheesesteak experience to the heart of their communities. Our restaurants require a small footprint, a small staff and low overhead, and the Great Steak executive team will actively work with you to find the best location for your business. In addition, initial training will be extensive, and the Great Steak team will assist you in growing your business as you become the premier cheesesteak restaurant in your community. One of the biggest positives franchising with Great Steak is that you get the support of Kahala Brands, a global franchisor that specializes in growing the 20 QSR brands in its portfolio, including Cold Stone Creamery®, Blimpie®, Pinkberry® (in the U.S. only) and Planet Smoothie®, to name a few. Kahala Brands’ power is reflected in its annual systemwide sales of nearly $735 million, and in its 3,000-plus locations in 28 countries around the world.